Poundland offers an incredible variety of products at unbeatable prices, ranging from tasty food to beauty products, stationery, crafts and more.Not everyone has a Poundland store locally and travelling hours to get some dog food or toiletries, might cost more than the product itself. Accessing these affordable items doesn’t have to be impossible or bring unnecessary stress. Pinga is here to help, offering you the chance to get anything you wish from Poundland in just a few steps. No need to leave the house, let our team take care of your next purchase of notebooks or makeup. Get started using the app by downloading it on your phone. All you have to do to receive your order is dispatch your request to our trusted Pinga Partners and have them process it. They will clarify every detail with you to make sure everything is correct and once you pay, you only need to wait for your products to arrive. Every payment through the app is secure and our team of professionals will ensure that your Poundland delivery arrives safely to your door. Worried about how many items you need to buy to place an order with Pinga? No need, as our app lets you use it even if you only need to buy a set of pens. You are under no obligation to purchase more than you want just to be eligible for shipping. Enjoy stress free shopping any time you want! Let our team help you with any of your future orders, both from Poundland and other stores. Our Pinga Partners are professionals and trusted, they will take care of every aspect of ordering your products. Get started today, find out below how the app works and anything else you need to know about our service. Pinga delivers any items from Poundland today. 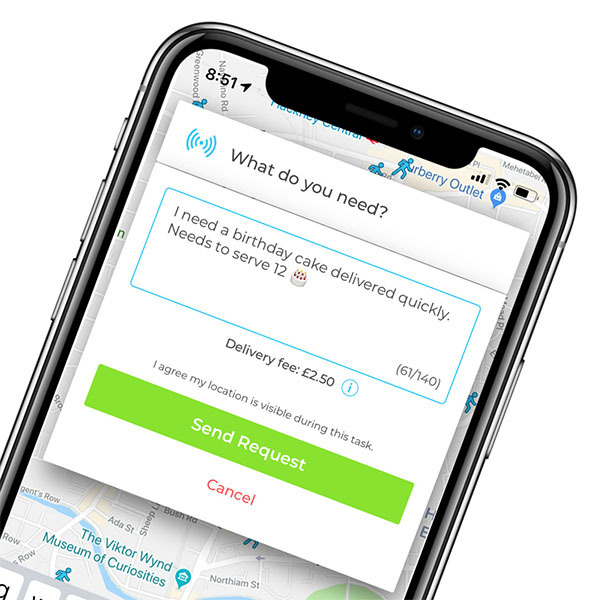 Infact our service normally delivers within an hour, so if you’re looking for same day delivers from Poundland, send your request via the Pinga App. Describe what items you needs to be delivered from Poundland and send your request. Pay securely within the app and receive your Poundland items to your door!